It is just past one o’clock. My stomach is already rumbling as I make the turn from Forest Drive onto Hillsmere. In a small shopping complex with red signs and storefronts, the name Taqueria Juquilita immediately catches my eye. This is the place. I scan the room. To the left, a television is mounted on the wall, playing some indistinct Univision telenovela (a Latin soap opera), a fridge stands full of Jarritos (Mexican sodas), tortillas, and salsas, and a big red, white, and green sign reads MEXICO. The cash register is front and center. There is no menu on the counter or mounted on the wall behind it, no visible signs of a menu anywhere—just a handwritten sign that says Cash Only. To its left, a few obscure pictures hang that may or may not show anything related to Mexico or the restaurant. This is exactly what a bona fide hole-in-the-wall looks like. I barely have time to look to the right when a smiling, jovial man asks if he can help me. He’s radiant, excited to see me. When I tell him I’m here to see Alberto, his face breaks into an even wider grin. “That’s me, I’m Alberto!” He’s positively beaming. “This guy is awesome,” I say to myself. He grabs me a Jarritos mandarina (a mandarin orange-flavored soda), and we get started. “We [Rojas-Zayas, his parents, and his two siblings] came to Orange County in California in 1990,” Rojas-Zayas begins to tell me. Suddenly, he runs back into the kitchen, and I hear him saying “Mama, fue mil novecientos noventa, Septiembre, verdad?” His mother confirms that his memory is correct—September 1990. 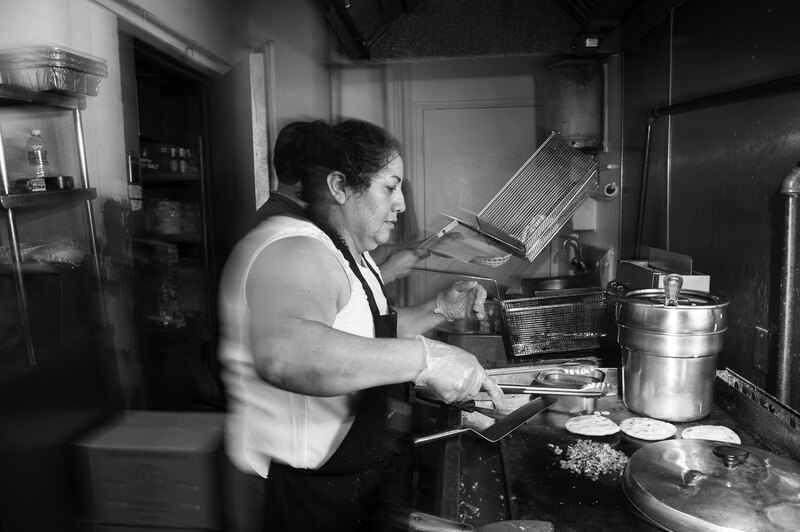 She is also the culinary genius behind Taqueria Juquilita, and has been cooking since she was a child living in Mexico. She makes all the sauces, cuts all the peppers, onions, and cilantro. Except for the tortillas, everything is done from scratch. “My mom cooks as if she’d be cooking for us,” Rojas-Zayas tells me. This is the definition of a true family establishment. Indeed, Taqueria Juquilita is doing something right. When I ask Rojas-Zayas what I should order, he runs through the list. Offerings include everything from the usual enchiladas, tacos, burritos, and quesadillas to more exotic options such as menudo (a traditional Mexican soup), mole (a chile/chocolate sauce), elotes (Mexican-style corn on the cob), and burritos mojados, wet burritos smothered in tasty green or red chile sauce. I order the burrito mojado, and start salivating when it arrives. You can tell that this burrito was not just thrown together, but prepared with care and attention to detail. The first bite bears out the quality of the food. The sauces—I opted for half red and half green—are exquisite and the spice is not overbearing. Subtle flavors of tomatillos, garlic, onions, and cilantro come through. Delicate shreds of perfectly cooked chicken fill each bite. As I ease into eating mode, I forget about the interview and then realize that Rojas-Zayas is still sitting there, smiling at me as I enjoy my meal. He doesn’t seem the least bit surprised. 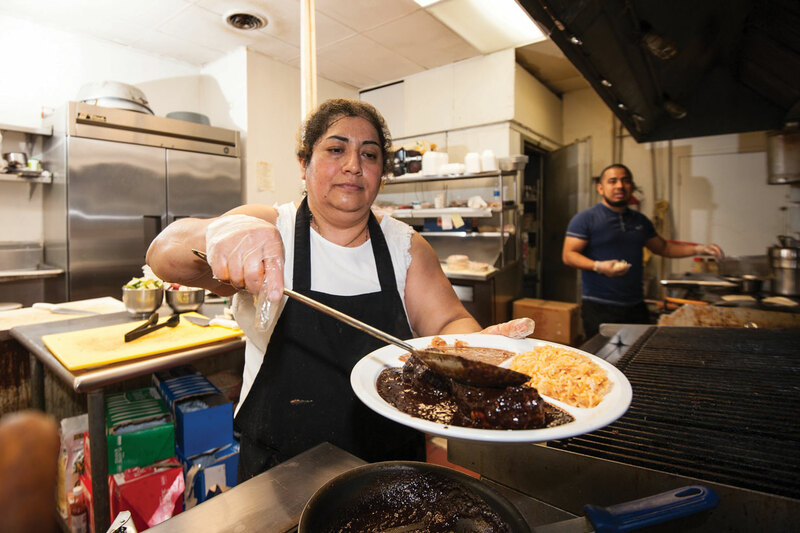 Taqueria Juquilita opened in 2007 and is still working to realize its full potential. Plans are in the works to launch a website and bring in a credit card machine. It is located a little off the beaten path, but being just across the street from Quiet Waters Park, is a perfect place to stop for a quick meal after a hike or a bike ride. At the Mexican tienda a few doors down, you can buy traditional products such as the Oaxacan cheese you enjoyed at dinner. As I finish up the interview, Rojas-Zayas’s mother comes out and delivers some elotes to his sister. I get excited about this type of corn, which is grilled with Oaxacan cheese and butter and sprinkled with chili powder. Rojas-Zayas catches my enthusiasm and runs back to the kitchen to get one for me to go. As I pack up my laptop and turn off the tape recorder, Rojas-Zayas trots over to the cash register to ring up a customer who had a Torta Cubana—a Cuban style sandwich that was so large that it looked like two sandwiches. I cannot make out the exact price on the register, but, including a Mexican cola, the bill comes to less than ten dollars. Error: Error validating access token: Session has expired on Saturday, 09-Mar-19 15:57:50 PST. The current time is Friday, 19-Apr-19 11:59:31 PDT.